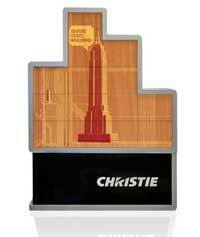 Projection company Christie has introduced a new product that allows the creation of a display in basically any size and shape. MicroTiles are modular digital display tiles that can be stacked or clustered just like mosaics. Christie said they are bright enough, have enough contrast, and have viewing angles wide enough to be seen clearly from a distance. The company said the combined units create a nearly seamless image, owing to a tight 1 mm gap between the tiles. The technology used is based on LED and DLP, and there are no lamps or other consumable parts to replace. The LED, according to Christie, is rated at 65,000 hours of half-brightness usage, or nearly 7.5 years of continuous operation. Each MicroTile has a screen size of 16” (W) x 12” (H) x 10” (D). They require two inches of clearance for rear ventilation. They may be assembled one way, and then may be taken apart and assembled in a new configuration without requiring any adjustments by the user. The tiles recognize each other and adjust the image, including color calibration, automatically using built-in sensors. MicroTile walls are controlled by a unit that processes the signal from any of a number of available digital signage and media players. Christie is currently offering a beta version of MicroTiles Designer software, which lets users design a MicroTile wall, and then see how it will look in the user's space, create a reference diagram, and generate a bill of materials.